The PPP, the PML(N), President Pervez Musharraf and Pakistanis have been witnesses to several political marriages of convenience in the last 20 years. Examples include Bhutto-Zardari marriage, Bhutto-Musharraf marriage and Zardari-Sharif marriage. Mr. Asif Zardari has emerged as the most powerful person in Pakistani politics in the wake of Benazir Bhutto's assassination and the subsequent PPP victory in the recent elections. 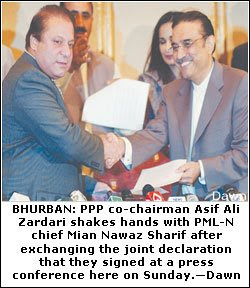 Mr. Zardari was heavily involved in the the government and politics of Pakistan during the PPP's last two terms as the ruling party. Some of the questions that often beg for answers revolve around Benazir's opinion of her marriage to Asif and how her perception of Asif evolved over time. While it is hard to get accurate answers to such questions, it is possible to guess based on the words and actions of Benazir during her 20 year marriage to Asif Zardari. When Benazir was engaged to marry Asif back in 1987, she told the New York Times that she agreed to the marriage, negotiated by her mother and other relatives over the last year, as a matter of "religious obligation and family duty." She went on to say "I must confess that if it hadn't been for my own peculiar position, where I have to consider the political ramifications of every step I take, then perhaps this would not have been an arranged marriage, but, in the circumstances, it seemed the only course," she said. During her two terms in office, Benazir's husband was widely believed to be involved in corrupt dealings on major contracts with foreign firms doing business in Pakistan. In fact, he earned the nickname "Mr. Ten Percent" for the 10% commission he is alleged to have demanded and got on every significant deal. In 1998 when Mr. Nawaz Sharif was the prime minister, The New York Times reported as follows: "A decade after she led this impoverished nation from military rule to democracy, Benazir Bhutto is at the heart of a widening corruption inquiry that Pakistani investigators say has traced more than $100 million to foreign bank accounts and properties controlled by Ms. Bhutto's family." 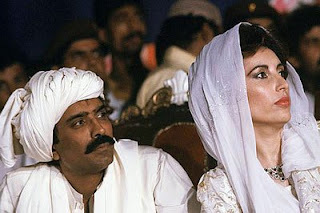 The 1998 NY Times report further said "But they trace the pervasive role of her husband, Asif Ali Zardari, who turned his marriage to Ms. Bhutto into a source of virtually unchallengeable power." "In 1995, a leading French military contractor, Dassault Aviation, agreed to pay Mr. Zardari and a Pakistani partner $200 million for a $4 billion jet fighter deal that fell apart only when Ms. Bhutto's Government was dismissed. In another deal, a leading Swiss company hired to curb customs fraud in Pakistan paid millions of dollars between 1994 and 1996 to offshore companies controlled by Mr. Zardari and Ms. Bhutto's widowed mother, Nusrat", according to the NY Times report. Benazir was well aware of the damage Mr. Zardari had done to the PPP and her personal reputation and worked hard to keep her husband away from the political spotlight. In fact, she asked him to go to New York and stay there in an apartment away from the media to be neither seen nor heard. Rita Payne of the BBC wrote as follows in a recent column published on BBC.com: Her ability to switch alliances for political advantage was in evidence after the 1999 coup, when Nawaz Sharif was sacked by Pervez Musharraf. Initially she welcomed the move but was back in the studio three months later to condemn President Musharraf’s performance. Is the honeymoon over, I asked her as we waited for the interview to begin. She responded with a rueful smile, “all marriages are made in Hell." Sadly, there wasn’t another opportunity to follow this up." The political marriage of convenience between Benazir and Musharraf arranged by the United States leading up to the Bhutto/Zardari amnesty and Bhutto's return happened much later. Everyone now knows how that marriage turned out. While Musharraf kept his end of the bargain, Benazir quickly turned on Musharraf for her political advantage. Unfortunately, she did not survive to see the success of her party and Zardari took effective control of the PPP. However, it seems that the key phrase from her lips "All marriages are made in Hell" may be an allusion to more than her problems with Musharraf at the time Ms. Bhutto made the statement. While the history of such marriages does not give us much confidence in their potential success, only time will tell if the latest marriage of convenience between PPP and PML(N) will succeed. A three-judge Supreme Court bench, led by Chief Justice Iftikhar Muhammad Chaudhry, resumed hearings into accusations that the spy agency, the Inter-Services Intelligence Directorate, paid $6.5 million to a right-wing opposition alliance to influence the outcome of the 1990 election. The case is potentially explosive in a country where the ISI has a history of meddling in politics yet its officials have largely escaped judicial censure. But analysts are divided about its chance of success. Wednesday’s hearing was cut short after the court heard that statements recorded in 1998 by three crucial witnesses, including a former ISI chief, Asad Durrani, could not be found. A lawyer for Mr. Durrani said he was out of the country. Justice Chaudhry ordered court officials to find the documents and summoned Mr. Durrani to a hearing next Thursday. The scrutiny began in 1996 when Asghar Khan, a retired air force officer and politician, asked the court to investigate allegations that the ISI had donated $6.5 million through Mehran Bank to the opposition in advance of the 1990 election. The ISI, it was said, wanted to oust Benazir Bhutto, the prime minister, in favor of the Islami Jamhoori-Ittehad, a coalition of conservative and religious parties headed by Nawaz Sharif, who went on to win the election. Early hearings in the case brought striking revelations that embarrassed the military. Mr. Durrani, the former ISI chief, told the Supreme Court that the money had been distributed on the instructions of Gen. Mirza Aslam Beg, an army chief and Mr. Durrani’s boss at the time. General Beg, in turn, said he had done so on the orders of President Ghulam Ishaq Khan, who opposed Ms. Bhutto. The hearings stopped in 1999 after a military coup brought Gen. Pervez Musharraf to power but were revived in January at the instigation of Justice Chaudhry, who is eager to disprove critics who accuse him of going soft on the powerful army. The resurrection of the case has potentially stark implications for certain politicians. Among the recipients of the ISI money was Mr. Sharif, the current opposition leader, who allegedly got $1.6 million. Should the charges stand, he and other prominent politicians, like Syeda Abida Hussain, a former ambassador to Washington, could be barred from office. But just how far the court is willing, or able, to go against the powerful ISI remains to be seen. On Wednesday, the court heard that a confidential statement recorded by Mr. Durrani in 1998 had disappeared, as had separate statements by Naseerullah Babar, a former interior minister, and Younis Habib, a businessman and banker who helped distribute the illegal money. Moreover, two central figures in the affair — Mr. Babar and Ghulam Ishaq Khan, the former president — are dead.